Oh how those words ring true for those of us who jump from rental home to rental home. While not always an easy task, we gladly meet the challenge of making a rental home our own even though we're merely transient dwellers. Where we live is our home, regardless of ownership, and it's only natural to want to make it at least look and feel like our own. Here are some great low-cost rental home decorating ideas that I've collected and now share with you in hopes that you'll be inspired to make your rental an abode you're proud to call home. 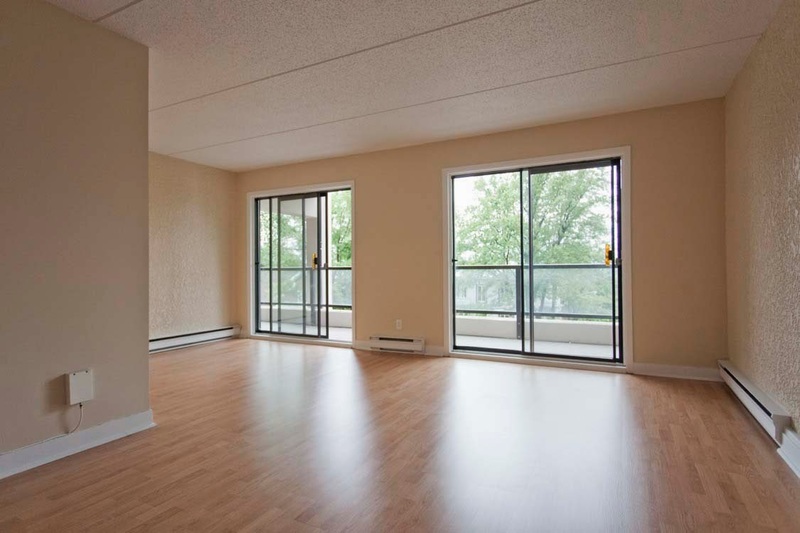 How do you feel when you walk into an empty box of a rental like this property from Renters Pages? There's so much potential but where do you start in making this your own? What sort of temporary fixes can make a space like this feel like home? 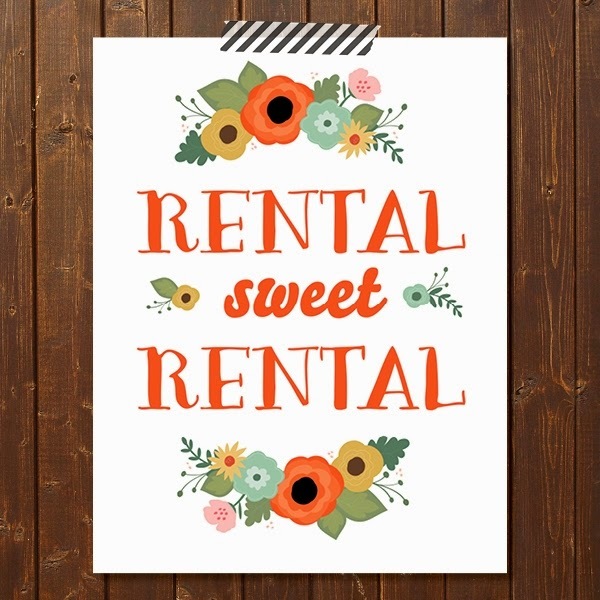 I hope the rental ideas below inspire you to make a "rental sweet rental"! I love the idea of finding beautiful sheets of wrapping paper or wallpaper, then placing the paper in large frames and hanging them on the wall. This serves as a beautiful focal point in any space and is very affordable. Ikea has some wonderful large frame options. If your landlord doesn't allow the use of nails, 3M Command Hooks serve as very effective but temporary hangers. 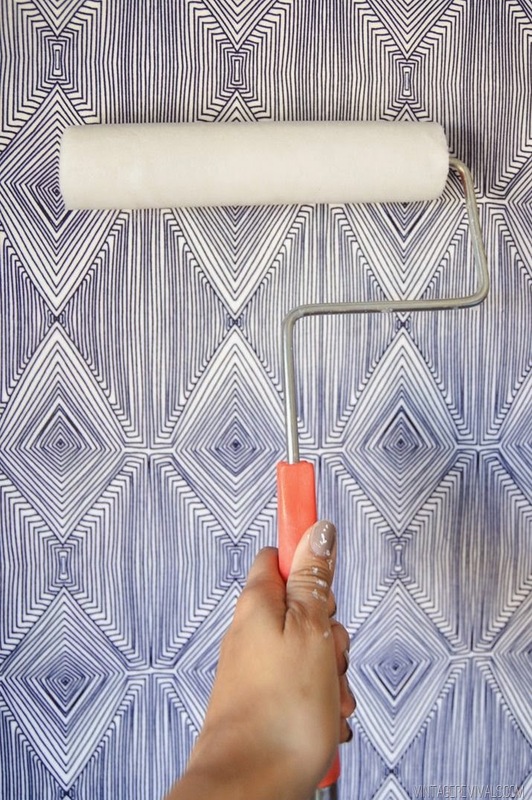 Thanks to new wall covering technologies, there are even temporary wallpaper options for renters! The above photo shows a temporary wallpaper by Chasing Paper. The options and patterns they offer abound. 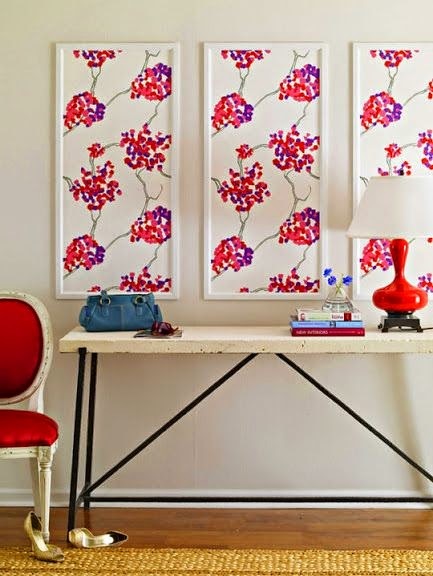 The temporary wallpapers would be a lovely feature in an entryway, a small powder bath, or covering an accent wall in a larger room. There are some great DIY tips available on many blogs, like Mandi's Vintage Revivals blog (see photo above), which share how to use fabric and fabric starch or corn starch to create a wallpaper-like temporary wall treatment. The finished product looks amazing, so it's definitely a great option for renters and homeowners alike. A final cost-effective wall treatment idea is to create a stamp with craft foam and cardboard, then use paint to repeat a pattern on a feature wall. 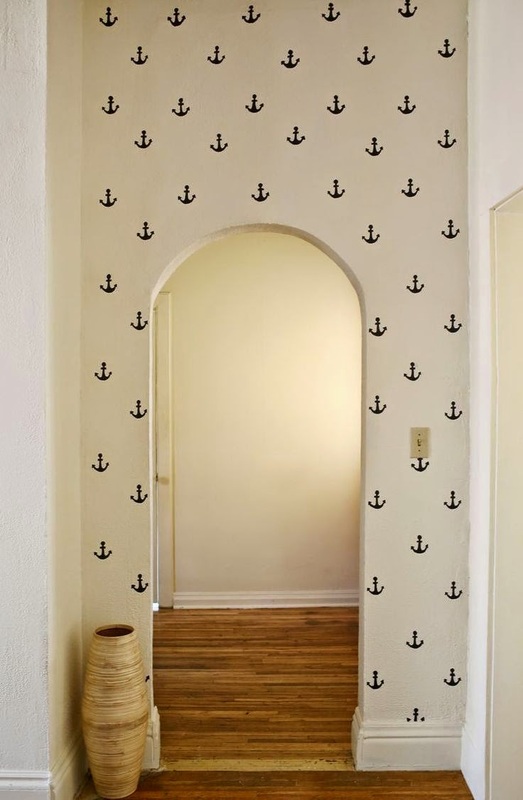 The above anchor motif was created by A Beautiful Mess blog. The easy DIY instructions can be found here here. Can you believe it, y'all? This is NOT a stainless steel dishwasher!! 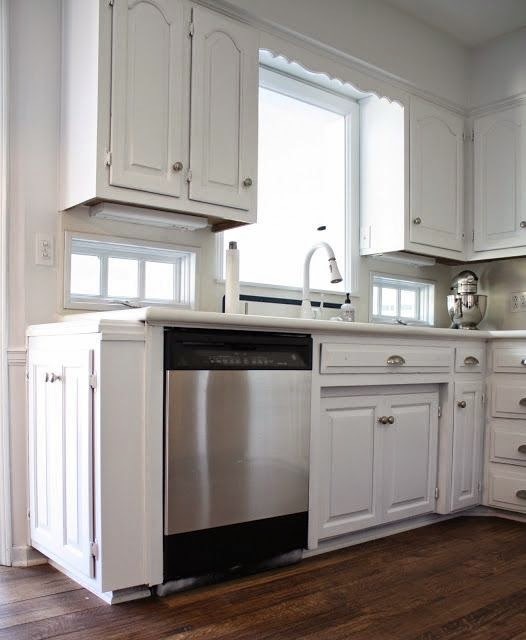 You can purchase stainless steel contact paper at many home improvement stores and apply it to the fronts of appliances and even cabinets for a temporary upgrade. It looks very real and completely updates a space. Details for applying the contact paper can be found on the Coordinating Yours blog. 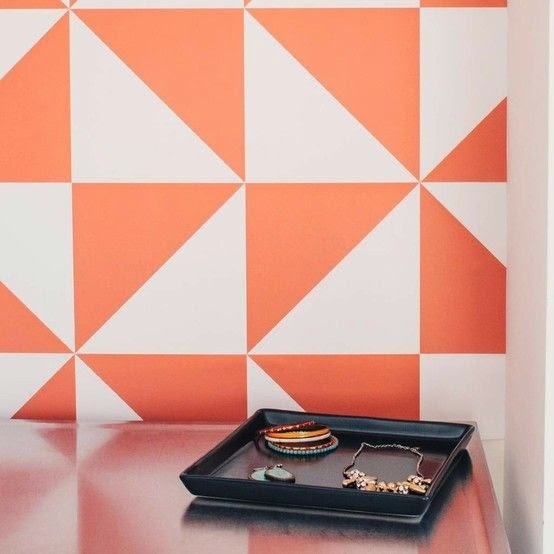 Just like temporary wallpaper, temporary tiles can be used to temporarily dress up a rental space. 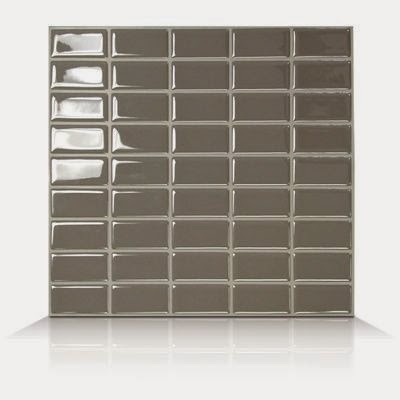 Smart Tiles is a company that has myriad options of temporary peel and stick tiles that can be used for a kitchen or even bathroom vanity backsplash. This DIY rolling shelf system is a fantastic kitchen storage idea for renters. There is often extra space to the side of a refrigerator, so this utilizes that void as a clever storage solution. 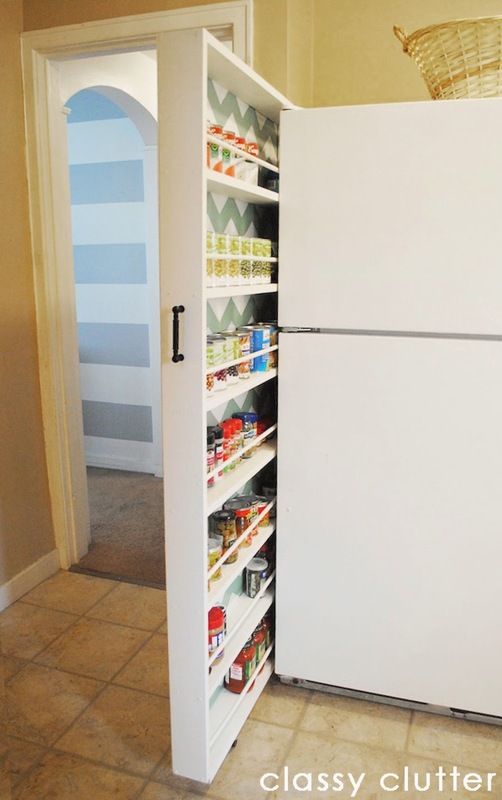 It's the perfect option in a rental home that lacks pantry space. The instructions for building your own similar storage system can be found on the Classy Clutter blog. I'm especially partial to a blackboard paint kitchen basksplash because that's what we have in our rental home right now. 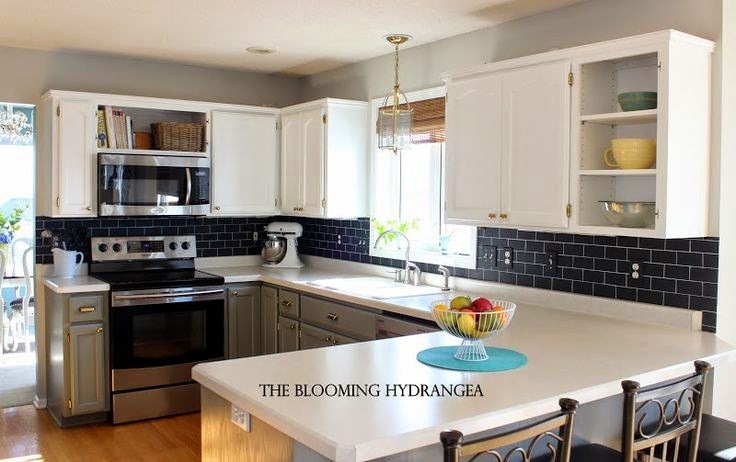 The photo above shows a great example of using a chalk pen over blackboard paint to create subway tiles for a backsplash. The tutorial for how to do this (the right way) can be found on the Blooming Hydrangea blog. Does your rental have an unsightly light fixture that you'd love to cover? 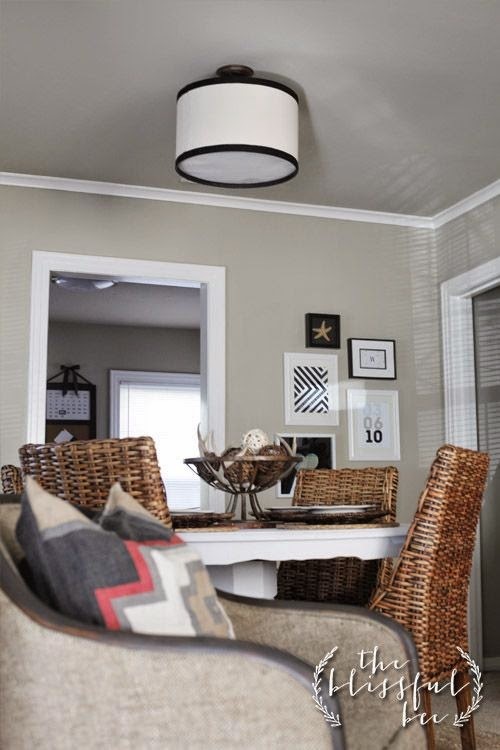 Well if you have a semi-flush mount light fixture, here's a fantastic idea...use a drum shade to cover the existing fixture. Details on how to do this can be found on The Blissful Bee blog. Keep in mind, some landlords allow you to actually change lighting as long as you reinstall the original fixture before you move out. We've done this in our rental, and it's made a HUGE difference. No mudroom, no problem! Here's a great way to create a visually attractive and highly useful spot for shoes, umbrella, and coat storage near an entry or in a laundry room. Use a boot tray, wooden crate or large baking pan for shoes, an umbrella stand or large vase or pitcher for umbrellas, and decorative hooks hung on the wall. An addition of a small floating shelf would be a prime spot to drop keys and mail. Window treatments that don't require any installation of hardware are a fantastic option for renters. 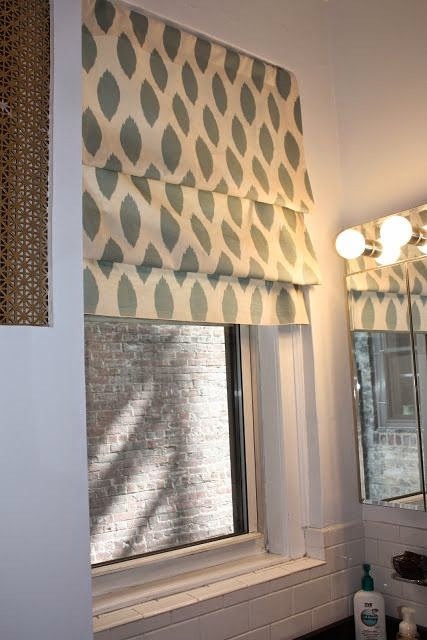 The above no-sew faux Roman shade treatment featured on the Southern in the City blog is a brilliant concept. The use of multiple tension rods, fabric, and iron-on hem tape allows for a high-end look without an expensive price tag. There's no way to tell those aren't expensive Roman shades! Well friends, those were just a few of my favorite ways to help make a rental your own. What other ideas have you used to fix up your rental space to make it feel just a little more like home? Do share!